Another unusual collaboration: the same front line as on #001â€”Frisell, Jenny Scheinman and Ron Milesâ€”but without a rhythm section, and as part of a project that includes visual animation by Jim Woodring, the artist responsible for a number of Frisell's CD covers including Gone, Just Like a Train and Bill Frisell with Dave Holland and Elvin Jones. At the start of the performance, Frisell says, "I just can't do it; I was gonna explain what we're gonna do, but now that I'm up here, in front of you all, I just can't do it. So you'll just have to...figure out for yourselves." The good news is that this download also includes video files, so it's possible to see Woodring's animation accompanying Frisell's music, which includes music from Bill Frisell, Ron Carter, Paul Motian ("Worse and Worse") and History, Mystery ("Faces" and "Lazy Robinson"). 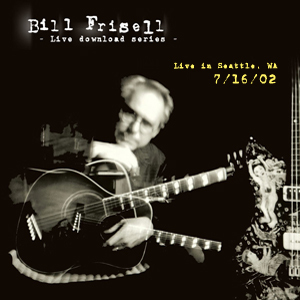 But beyond the unusual instrumentation of guitar, cornet and violin, it's the presence of three more tunes that have not shown up on any of Frisell's other recordings to dateâ€”the dark-hued "Mandala," comedic "Frogs" and countrified closer, "Whim Grinder"â€”that make this yet another essential download.